The U.S. House of Representatives passed legislation on September 12 that helps to protect PTs and other health care providers who travel across state lines with sports teams. The Sports Medicine Licensure Clarity Act (HR 921/S 689) aims to provide added legal protections for sports medicine professionals when they're traveling with professional, high school, college, or national sports teams by extending the provider's "home state" malpractice and professional liability insurance to any other state the team may visit. The bill also opens the possibility of coverage for PTAs who are under the direct supervision of a PT. The Senate has not yet scheduled a date for a vote on the bill, and APTA advocacy staff members are working with sponsors to determine next steps. For more information about this legislation, see this PT in Motion news story. The Centers for Medicare and Medicaid Services (CMS) propose to adopt new CPT code descriptors for physical therapy evaluations and reevaluations, which will be effective Jan. 1, 2017. 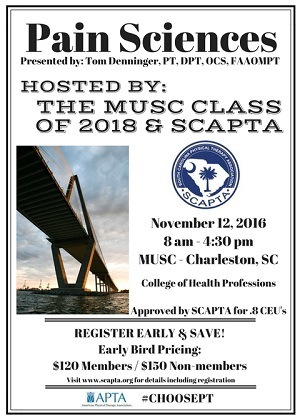 APTA is hosting a 90-minute session on Sept. 22 from 2:00 to 3:30 pm Eastern, designed to introduce physical therapists to the new codes and to teach therapists how to select the appropriate evaluation code based on patient presentation. The new evaluation codes are split into 3 levels: low complexity evaluation, moderate complexity evaluation, and high complexity evaluation. Physical therapists will need to select the appropriate evaluation level based on 4 components: patient history, examination, patient presentation, and complexity of clinical decision making. Please note that live webinar registration has completely sold out. However, the recording will be available on APTA’s Learning Center for 24/7 viewing beginning on Sept. 23. For more information related to the new therapy evaluation codes, visit APTA’s Physical Therapy Classification and Payment System (PTCPS) web page.